Rui Mandi is most famous place where you can get nail paint in cheapest price @ to you can buy nail paint from this market. This is very near to Bara Tooti Chowk Sadar Bazar the market closed only on Sunday you can come here on any day from morning 9 to evening 6 you can get all types of cosmetic items jewellery and all types of ladies item in this market. There are so many wholesaler distributor and manufacturer are having shop in this market they are selling it in very reasonable cost if we compare to other wholesale market Sadar Bazar is best for the nail paint you can get the nail paint starting from 1 rupees to 50 rupees. You can get very good amount of margarine minimum 10% to maximum 90% you can get from the steps of item especially if we talked about ladies item or cosmetic item the nail paint is the best item that gives you the best margin you can print your name also on the box . You have a special brand name you want to put on your bottle then you can also talk to the wholesaler or manufacturer you will get the same types of nail paint bottle you have the option to select the bottle also so you can get whatever you want all types of colours are available. 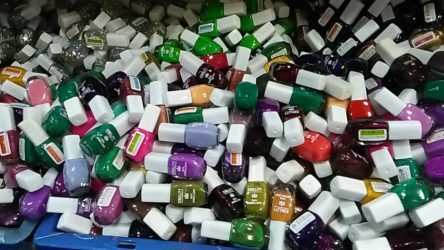 More than 100 colours you can get in nail paint even the thinner nail remover and so many cosmetic items you can buy from this market this is very crowded market so be aware of your pockets and jewellery is an all important accessories because so many pickpocketed are also available in the market. They may get the benefit of crowd and you will win and loss don’t run behind dalal.